It is cold in the car, cold as the grave. I prefer to leave the a/c on full, to let the falling temperature keep me alert. So began the first Charlie “Bird” Parker novel, “Every Dead Thing“ twenty-years ago. Written in the first person, Charlie had to come to terms with the murder of his wife and daughter at the hands of The Travelling Man. Now here we are twenty years and seventeen novels and one novella later with the longest Parker novel yet, weighing in at almost 700 pages. Parker has grown and matured over the years, dispensing with the Birdman sobriquet but very much becoming the scourge of evil, last hope of the lost. So, what is it about? Well, Charlie is on the trail of the seemingly immortal lawyer Quayle and his deadly protector and enforcer, the ghastly Pallida Mors. We learnt much about these two monstrous human beings in the previous novel “The Woman in the Woods”. Quayle believed he had got hold of the complete version of a book of unspeakable evil called The Fractured Atlas. Its pages had been scattered to prevent it from doing irreparable harm but now it appears Quayle is closing in on his objective to open up a channel to other worlds of fearsome creatures and other gods. But now Parker, Louis and Angel are on his trail. They have some scores to settle after what happened at the end of the previous book. Their visit to Europe is sanctioned by SAC Edgar Ross of the FBI and so they travel to London via Amsterdam. Being such a long book, there are many new characters introduced, among them Sellars, the serial killer, reclusive Douglas Hood, who discovers the body of the first unfortunate victim on the Hexhamshire moors in Northumberland, D.I Nicola Priestman and her team of detectives including Beatles-loving Derek Hynes and many, many more. Every character is brought vividly to life as Connolly deftly fleshes out their character and motivations. The author has been a master of this for a long, long time and, in this ambitious novel, he outdoes himself. 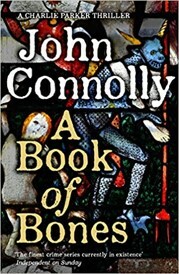 The danger in a novel of this length is that any author of such high-standing and success as John Connolly may be given carte blanche to do whatever the heck he wants, without the necessary editorial control. I am happy to report that this is not remotely the case. Connolly, as he happily admits, has moved out of his comfort zone. No crime novel this, A Book of Bones is a full-blown thriller and structurally very different from his previous novels. In fact, within the novel, four short stories are embedded. These are described as “kind of short ghost stories” by John, although their importance to the novel and its plot is absolute. I first came across this series back in 2006, when I casually picked up a copy of Dark Hollow on a friend’s bookshelf in Madrid. It looked like a gothic romance to me at first but I read the first few pages anyway and that was that. The next day, after finishing the book, I quickly got a hold of the first one and since then, I have been hooked on the series. As the years have passed, the author has got better and better. Whether he is giving us a brief history of an area or a character sketch of one of the characters, he never bores the reader. His writing is strong and, at times, poignant. I am not ashamed to say that, for the first time in all the years I have followed John Connolly, I was genuinely moved to tears and had to put the book aside for a while after reading a scene in which Charlie offers some comforting words to the distraught father of one of the victims in England. Powerful writing, indeed. The book is exciting, mesmerizing and never lets you go. Die-hard fans will devour it, while I know that first-time readers can enjoy it too but I thoroughly recommend that they go back at least two books before launching into this one. Those of you that want to know more about The Fractured Atlas should get hold of a copy of Night Music – Nocturnes Volume Two wherein you will find a 150-page novella called The Fractured Atlas –Five Fragments. Not essential but certainly worth your time. And pay attention to the epigraphs to each section of the book. You could do far worse than read Seamus Heaney’s Casualty or Ted Hughes’s Hawk Roosting. They help add to the experience of the novel. As you can probably tell, I was delighted by this book. It is a triumph and I cannot wait for the next one. Because, as always, although Connolly brings this thriller to a satisfactory conclusion, there is much to be learnt about certain characters that I am not at liberty to mention as nobody likes a spoiler. But I will ask this - John, where is Professor Ian Williamson, last seen in A Time of Torment? This is a five- star novel. How can Connolly possibly surpass it? I can’t wait to find out.